Can using essential oils help your dog to cope with anxieties and stress? 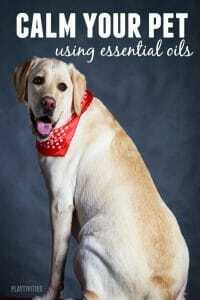 Is it safe to use essential oils for your dog? Autumn can be a scary time for our pets. With the onset of dark nights, Halloween and Bonfire night, with firework noises continuing long into the night and children outside shouting and shrieking, it’s no wonder that some of our dogs do get stressed. It is possible to use aromatherapy and essential oils to help our dogs to be more relaxed, less anxious with various situations, but there are several safety points that you need to know before you administer them. If used in the correct manner, essential oils can help to build confidence and to help calm, stressed dogs. Many people assume that essential oils are absolutely safe when used with animals, because they’re derived from plants, but because dogs are so much smaller than humans, and very sensitive, only small amounts of oils must be used. They can be harmful or overpowering if applied at full strength. Never apply aromatherapy oils to small breeds of animals, such as cats, birds or rabbits and always ask your Vet’s advice before using any therapies on your pets. There are various ways to apply the oils. Bear in mind that your dog may dislike certain aromas. Before you apply the oil, let your dog take a sniff, then begin with very small drops of the oil, mixed with a carrier oil. If your dog tries to reject this, rubs his face on the carpet, whines or pants, he most likely doesn’t like this oil and it’s not a good idea to continue its use. Oils may be mist sprayed topically, used in an atomiser or diffuser or for inhalation, or applied during massage or in a dog’s bath. You will notice if your dog reacts positively, by him yawning, sniffing the oil, sighing and increased blinking. LAVENDER OIL – a very versatile essential oil that soothes the central nervous system, and offers a calming effect, while creating a feeling of peace and harmony. If your dog often paces around, lavender oil may help to calm him. FRANKINCENSE OIL – a brilliant all round oil, rather less potent than many other oils. It can help to ease anxieties and calm your dog. LEMON OIL – this potent oil helps to ease confusion and is both clarifying and uplifting. In addition, it will also boost your dog’s immune system, helping him to fight infections. ROSEMARY OIL – chances are that your dog will love the aroma of this oil. It’s more beneficial to use this as an inhalant oil, rather than as a topical application. This oil has an effect on the dog’s nervous system, decreasing the amount of cortisol produced, in response to stressful situations. There are many other essential oils that will serve many practical purposes, such as CLARY SAGE, ROSE GERANIUM, CEDARWOOD OIL and YLANF YLANG. Aromatherapy oils will aid boosting the immune system, repelling fleas and insects, eliminating bad smells, and of course making your dog less anxious, calmer and less fearful of his surroundings.